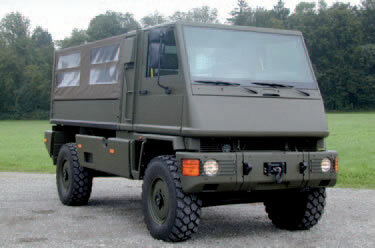 The Swiss DURO III 4×4 & 6×6 military truck was originally developed for the Swiss Army, it has proven to be a DUrable and RObust (hence designation DURO) successful design that has seen it exported to a number of other nations. The vehicle was initially developed by Swiss Firm Bucher-Guyer AG, with further development of the DURO II / DURO III and manufacturing by the highly successful Swiss Firm MOWAG. The Swiss Army ordered 3000 vehicles in 1994. The DURO III 4×4 is a two-axle, multi-purpose vehicle, powered by a six-cylinder diesel engine. The upper side of the chassis is free-standing and allows the installation of different superstructures and mission modules while maintaining a low centre of gravity. The compact design of the DURO results in low vehicle width and height which makes it C-130 aircraft transportable. 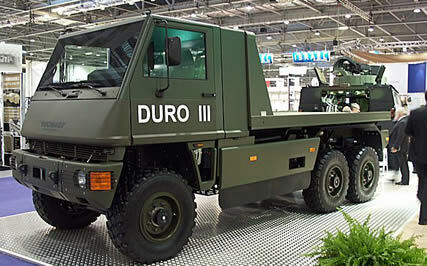 The DURO III 6×6 is a three-axle, multi-purpose vehicle, powered by a six-cylinder diesel engine. The upper side of the chassis is free-standing and allows the installation of different superstructures and mission modules while maintaining a low centre of gravity. The compact design of the DURO results in low vehicle width and height which makes it C-130 aircraft transportable. The DURO IIIP 6×6 is a three-axle, multi-purpose vehicle, powered by a six-cylinder diesel engine. The vehicle has a modular protection concept. With add-on armour kits the protection level of the cabin and of the shelter can be adapted to the mission requirements. 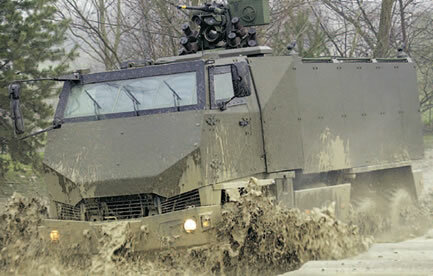 The vehicle provides full protection against light machine gun fire and against light anti tank mine threats. Due to the large protected utility volume, various mission kits according to customers’ requirements easily can be integrated into the vehicle. In March, 2012, General Dynamics European Land Systems delivered the 12th highly mobile field laboratory vehicle to the Swiss Army. Rheinmetall MAN Military Vehicles (RMMV) engineered and integrated three different mission modules for CBRN reconnaissance into General Dynamics’ armoured DURO 6×6 vehicle. All three configurations are equipped with an identical basic suit. These highly efficient laboratories, which can be quickly deployed to the operational theatre, contain all the required devices for thorough evaluation of data in the event of CBRN threat situations. In the event of a contamination, the crew can embark and disembark through a sluice in the rear of the vehicle for decontamination. These mobile field laboratories enable a rapid, highly technological and sustainable CBRN defence in the military as well as in the civil disaster control or against terrorist attacks. The DURO vehicles have become the chosen multi-purpose vehicle platform for various armed forces around the world, fulfilling a variety of tasks such as; logistics vehicles, troop transporters, ambulances, EOD vehicles, ambulances, mobile C3 stations, weapon tractors, etc.